Andrew DeWoody, professor in the Department of Forestry and Natural Resources and the Department of Biological Sciences, and Anna Brüniche-Olsen, a postdoctoral researcher in DeWoody's lab, wanted to understand how the booming population of gray whales in the east—numbering about 27,000 along the coasts of California and Mexico—is connected to approximately 200 western gray whales along the Russian coast. "At any one time, there is a huge disparity in the number of whales in each location. Some think that intense Russian and Japanese commercial whaling in the 1950s might have wiped out the entire population in the west," DeWoody said. "It's possible then that a few survived and have been increasing in population. Or some might have dispersed from the east to make up today's western population. It might also be a combination of the two." 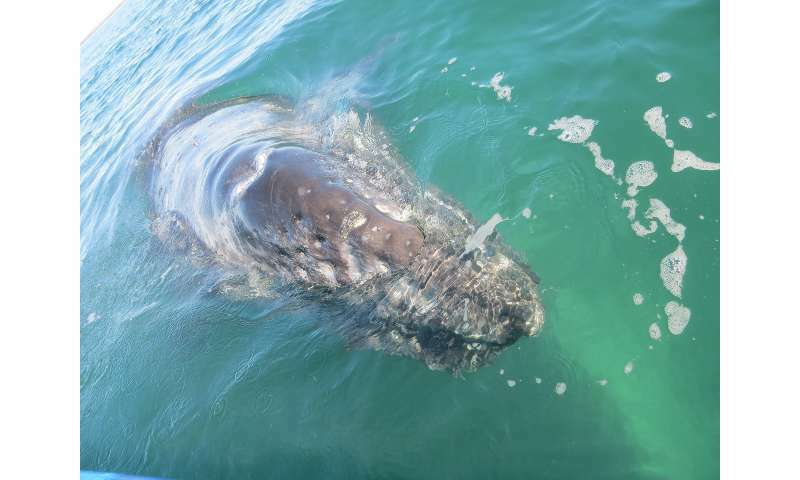 DeWoody and Brüniche-Olsen compared the genotypes of 77 western and 135 eastern gray whales and found that the two populations have diverged genetically. The genotypes show distinct alleles—variations in genes—in each group. The separation is similar to levels sometimes seen between distinct subspecies. The analysis also shows, however, that there is some genetic admixture. Whales have been observed traversing the Pacific Ocean, and genetic data show that there seems to be at least some interbreeding among the populations. "That's good news. If you have a tiny population, a critically endangered population as we see in the west, you want to maintain gene flow and make sure they don't lose genetic diversity," Brüniche-Olsen said. "There seems to be gene flow between the two. It might be that even though it's different population, they're not completely separated." The findings, reported in the journal Biology Letters, reveal that both populations of whales have significant amounts genetic diversity, which is especially important for the endangered western gray whales. The authors will monitor the subgroups to see whether they continue to diverge or if the intermingling will lead to a loss of the distinct groups. "Maybe they'll become one single gene pool in the future," DeWoody said. "Or they could be quite different and at some point won't mate with one another any longer." The findings may also inform new standards for the International Union for Conservation of Nature, which maintains the Red List, a comprehensive list of endangered animals around the world. DeWoody is involved with a group in the IUCN that is developing guidelines for using genetics to determine the threat level for animals such as the gray whale.